The political spin that so often is attached to discussions surrounding public policy and science is the focus of the March 2015 issue of the ANNALS of the American Academy of Political and Social Science. Politics and science are often intermix on matters including climate change, vaccinations, fracking, nuclear power, evolution, genetically modified organisms, and stem cell research, among others. “The Politics of Science: Political Values and the Production, Communication, and Reception of Scientific Knowledge” is the title of the issue, edited by Elizabeth Suhay (American University) and James N. Druckman (Northwestern University). 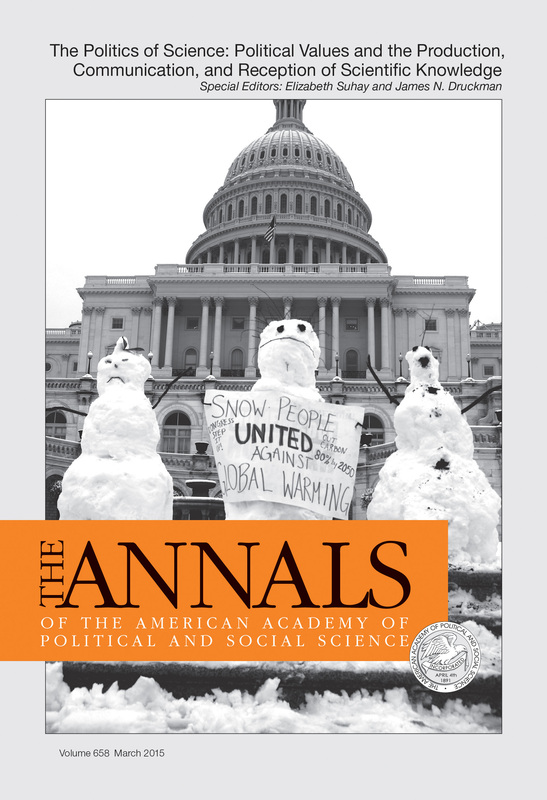 This issue of the ANNALS looks at the intersection of politics and science, an intersection that often is jammed with rhetoric, spin, and which is often debated 140 characters at a time. The fact that differences in scientific beliefs arise from not only political allegiances, but from religious and economic ideologies as well. Decision making about the truth of scientific findings is biased by preexisting value beliefs, a finding that is not unique to conservative political positions. Education alone is not enough to eliminate biases; indeed some of the most educated people who are most aware of the nuances of science/policy debates are those most likely to allow their values to color their understandings. Despite the aforementioned, there is no need for despair. Evidence exists showing that members of the public trust scientists more than they distrust them, and that more knowledge will eliminate political bias. “The Partisan Brain: How Dissonant Science Messages Lead Conservatives and Liberals to (Dis)Trust Science,” by Erik C. Nisbet, Kathryn E. Cooper, and R. Kelly Garrett. “Red States, Blue States, and Brain States,” by Francis X. Shen and Dena M. Gromet. “Geoengineering and Climate Change Polarization,” by Dan M. Kahan, Hank Jenkins-Smith, et al. The March 2015 issue, which also was the subject of a series of columns in the Washington Post’s “Monkey Cage” blog, is available now. The table of contents and articles are here. For more information about the issue, click here.